Making tutorials for educational purposes isn’t all that cheap, especially if you are not looking to make a profit out of your videos and require them for your students. A relatively easy, if not cheap method for making tutorials with voice over, cam input and PowerPoint slides has been the Camtasia Studio add-in. 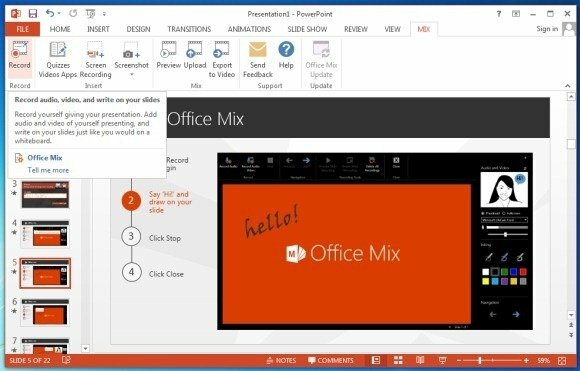 However, Microsoft has now made it possible to create high quality video tutorials right from within PowerPoint with the help of an add-in of their own, known as Office Mix. 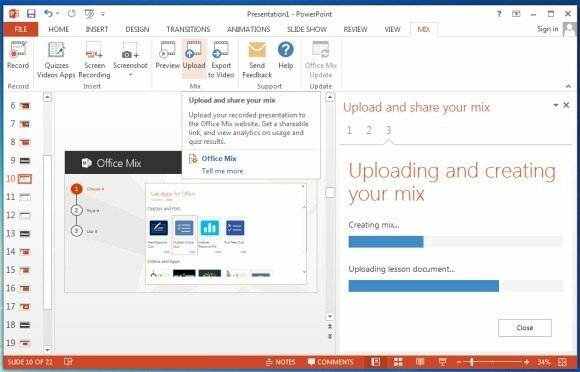 Office Mix is a PowerPoint add-in by Microsoft which extends the functionality of PowerPoint to make it possible for users to record screencasts with voice over and cam input to instantly create interactive online tutorials with the power of PowerPoint and your presentation skills. 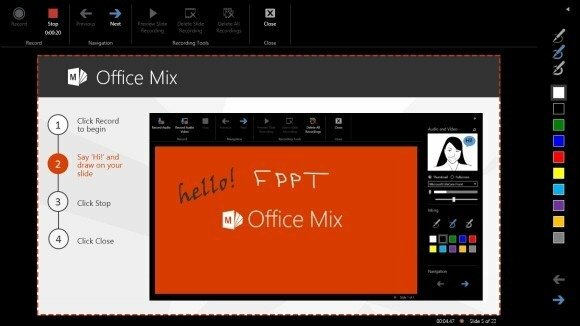 Office Mix is not just limited to mere screencasts as it also enables inserting quizzes, videos and apps. 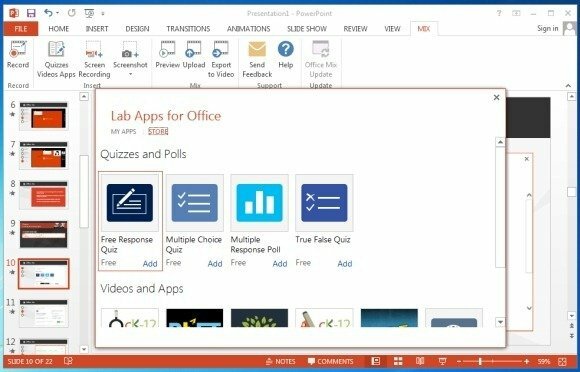 Hence, with Office Mix you can mix and mash your PowerPoint slides with apps, quizzes, videos and a lot more to create interactive lessons which can be uploaded to video streaming or social networking websites. You can also save these lessons offline and use them for classroom lectures and even make lessons for students who might have missed class or are looking for a quick revision. 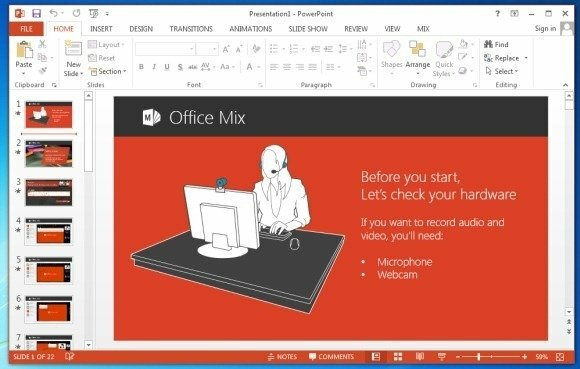 Office Mix Requirements: The Office Mix add-in currently only works with PCs running PowerPoint 2013 or Office 365. If you are using PowerPoint 2013, make sure that you have the Office 2013 service Pack 1 installed on your computer. Also make sure that you have at least .Net Framework 4 installed. 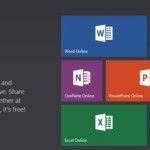 It is also worth mentioning here that Office Mix might install some additional packages on your PC, i.e., if they are not already installed on your computer. These include packages like .Net 4.5 and VSTO. For more details, see the Office Mix Troubleshooting Guidelines by Microsoft. Downloading Office Mix: Using Office Mix is easy! Simply go to the Office Mix website, login with your Facebook, Twitter, Organizational or Microsoft account and download the Office Mix add-in. Installing Office Mix: The Office Mix add-in comes in the form of a simple setup file. Once installed, the Office Mix add-in adds an extra tab to PowerPoint, from where you can begin creating your lessons. 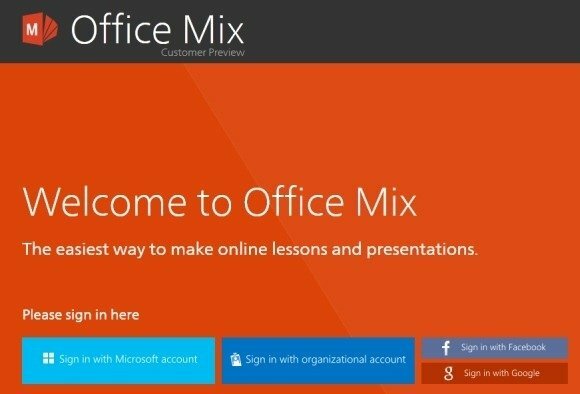 Office Mix also provides a helpful tutorial at startup to help you get acquainted with all major features. As you can see from the below screenshot, you can begin recording your video tutorials by clicking the Record button from the Mix tab. This will allow you to begin creating custom lessons with a variety of tools, including a whiteboard and the option to draw with marker tool using various colors. 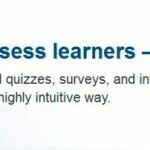 You can also insert videos, quizzes and apps to make your lessons interactive. This can greatly enhance your educational lessons and also allow you to engage your audience. You can also save, share and upload your Mixes in video format. Office Mix allows the flexibility to export videos offline, as well as to upload them to the Office Mix website. This obviously means that you can share the uploaded videos to any social media website via sharing link or even save them offline. 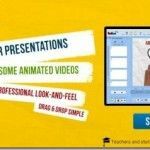 In the wake of Office Mix it is quite likely that alternative PowerPoint add-ins which enable making video tutorials might become obsolete. 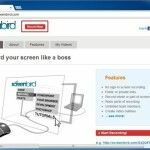 This is because Office Mix at inception has come with a wide range of options that are easy to use and quite handy for making video tutorials and interactive lessons. Moreover, it is quite likely that the number of available apps and customization options will increase with the passage of time. You can try out Office Mix with PowerPoint 2013 or Office 365 by downloading this add-in from the link given below.